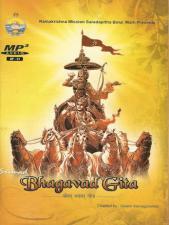 The complete Bhagavad Gita chanted in the original Sanskrit (MP3 format). We are pleased to offer this recording of the entire Bhagavad Gita, arguably India's most important and influential text, chanted in the original Sanskrit by Swami Sarvagananda. Swami Sarvagananda is a monk of the Ramakrishna Order and currently Secretary of the Ramakrishna Mission Ashrama. This audio CD is presented in MP3 format.